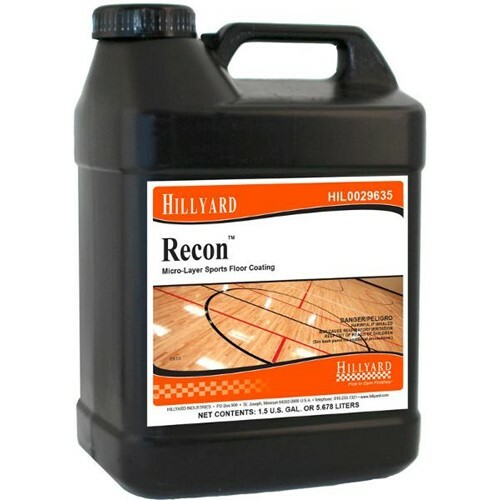 Recon is a revolutionary sports floor coating system that can eliminate the roller coaster effect of annual sports floor maintenance, and deliver new floor gloss and performance anytime you need it - for example, right before a mid-season tournament. It is a specially formulated, high-performance, high gloss, micro-layer sports floor coating that stands up to the rigors of athletic competition. Applying Recon takes just a little more time than a routine cleaning. A simple clean, apply, and dry process has your newly coated sports floor ready for play the next day! 2-Component, cross-linked formula for enhanced durability. Ultra-thin profile to stack multiple coats throughout the year. Would you like your Sports floor to look great, but a little unsure about how to do it? We are here to help! Follow this link, and we will contact you to get started. Images of Recon in Action!